Sometimes you learn the most when you get it wrong. As easy as it is for investors to trumpet their successes, we can learn much more from examining our failures. So, as 2015 comes to a close, we asked three of our contributors to do just that. Read on to learn from what they describe as their single worst predictions this year. Steve Symington: In early September, I pounded the table on GoPro (NASDAQ:GPRO) after shares of the action-camera maker plunged following weak guidance from video processing chip supplier Ambarella (NASDAQ:AMBA). After all, though Ambarella management blamed the projected revenue shortfall on an expected sequential and year-over-year decline in sales from the wearable camera segment, they also insisted it was due primarily to the fact that several major product launches occurred in calendar Q2 rather than in Q3 in past years. In fact, according to Ambarella CFO George LaPlante during that quarter's conference call, taking the average of Q2 and Q3 unit shipments together showed growth was still in line with Ambarella's expectations for the wearable camera segment at the time. I accordingly argued that "it seems premature at best to declare Ambarella's guidance to be bad news for GoPro right now." To be sure, only a few weeks later another sign of trouble came when GoPro reduced the price of its tiny HERO4 Session camera by $100 to a "more accessible" $299 -- a sure indicator the new device wasn't selling well when priced comparably to GoPro's massively popular HERO4 Silver and Black models. GoPro followed this up by falling short of its own quarterly guidance for the first time since its IPO, and by saying it expects revenue during the crucial holiday quarter to decline around 17% year over year. Considering that GoPro lowered the price of its HERO4 Session by another $100 to just $199 earlier this month, now I fear it might not even be able to live up to that painful outlook. 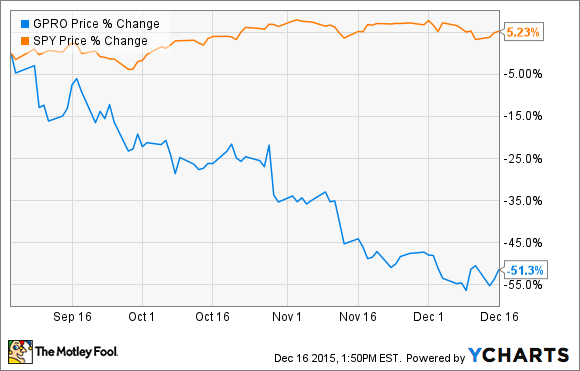 None of this is to say that GoPro can't make up for all of this with new product launches in 2016 -- including its recently named Karma drones, new virtual reality gear, and almost certainly a new high-end line of HERO cameras -- but for the time being my call on GoPro stock in September was easily my worst "prediction" of 2015. Todd Campbell: Between last fall and this past March, I penned five articles highlighting the potential market opportunity for 3D Systems (NYSE:DDD) in healthcare, including the growing use of 3D simulation and 3D-printed prosthetics and implants. Although 3D Systems made progress capturing market share in those markets this year, that progress did little to stop the company's declining share price. 3D Systems acquisitions of LayerWise, a medical and dental 3D player, and Simbionix, a 3D virtual reality and printing company, resulted in healthcare revenue growing 15% year over year to $99.3 million through the first nine months of 2015; however, 3D Systems shares have crashed 72% during that same period. Could 3D Systems turn a corner? Perhaps, but it will take time for cost-savings strategies to rekindle profit and bulk up its cash stockpile, which has been nearly cut in half this year. The company will also need to kick-start healthcare sales, which slipped 7% in the third quarter versus a year ago. Fortunately, the company doesn't have much debt on the books and industry watchers still think it could post a profit next year. Regardless, investors interested in buying 3D Systems shares may need a healthy dose of patience and a high-risk tolerance to tolerate what's likely to be a bumpy ride. Tyler Crowe: By far the worst prediction I made this year was that I thought upstream master limited partnerships LINN Energy (NASDAQOTH:LINEQ) and Breitburn Energy Partners (NASDAQOTH:BBEPQ) wouldn't have to cut or suspend their dividends beyond the cuts made in January. It was my opinion that LINN and Breitburn had large enough hedges on their oil and gas production to protect their cash flows, which would allow them to avoid another cut. Well, so much for that. In the past few months, these two, as well as a slew of other upstream oil and gas producers, have suspended their payouts to shareholders -- indefinitely. One of the conditions for this train of thought was that the market for oil and gas would be back on the upswing by now. However, production across the U.S. and globally has been much more resilient than previously thought. Now, with oil trading below the $40 per barrel range and few signs it'll get better in the next six to 12 months, it's apparent that even a two-year hedging portfolio for companies like LINN and Breitburn was not enough to offset their bloated balance sheets.